Beginning in the 1980s, archaeologists with the Beaverhead-Deerlodge National Forest began to investigate German Gulch as there was a resurgence of mining in the area. Excavations by GCM Inc., a private archaeology company, in the 1980s and 1990s uncovered thousands of artifacts relating to both the Euro-American and Chinese occupation of German Gulch. Artifacts included Chinese ceramics and food, firearms, and a diverse variety of bottle glass and personal items. These items provide archaeologists an important window into the past and help us understand how these miners lived and worked in German Gulch. Please follow the link below to learn more on the archaeology of German Gulch through a website created with the financial assistance of Montana Humanities. 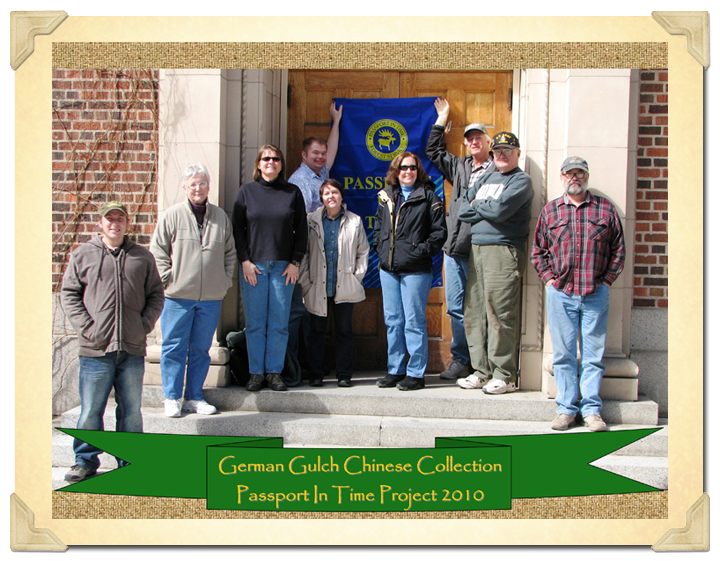 In 2010, volunteers with the United States Forest Service's Passport in Time (PIT) program assisted University of Montana researcher Bill Norman re-process the several thousand artifacts recovered from the German Gulch site. Over the last two decades the collection had fallen into disarray, and volunteers accomplished re-bagging, tagging, cleaning, and cataloging all of the artifacts within a single week PIT project. Without the assistance of these volunteers nothing could have been accomplished. If you would like to know more information about any of the projects or information on this website please feel free to contact us via email. In addition, if you know of any Chinese sites or historical references regarding Chinese in Montana, please direct your queries to Chris Merritt or Dr. Kelly Dixon.